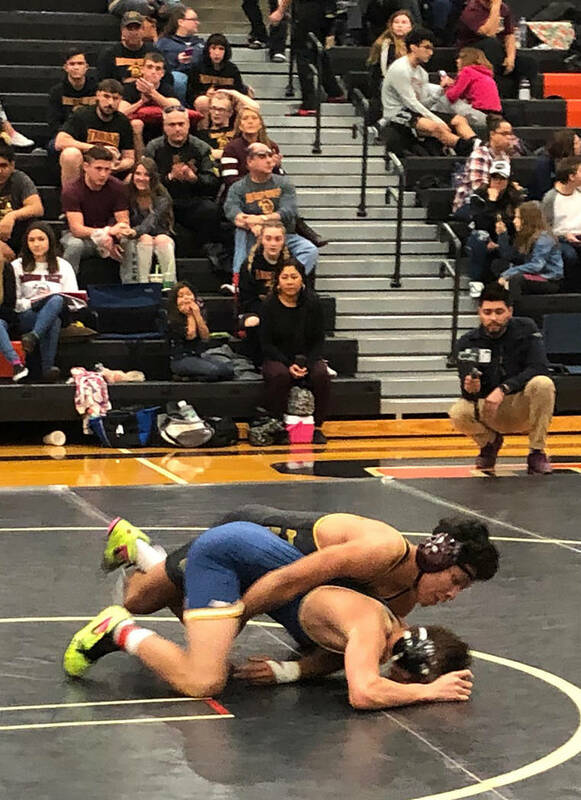 The ups and downs of sports were fully on display Friday and Saturday for the Pahrump Valley High School wrestling team at the Chaparral Invitational in Las Vegas. 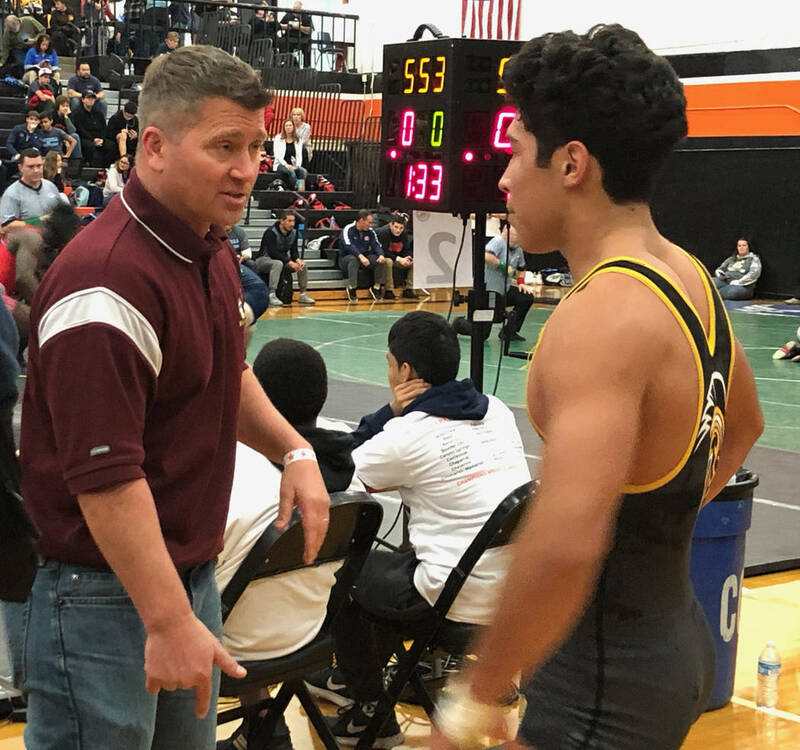 Tom Rysinski/Pahrump Valley Times Pahrump Valley wrestling coach Craig Rieger talks to senior 145-pounder Isaak Cruz after Cruz won the third-place bout Saturday at the Chaparral Invitational in Las Vegas. Tom Rysinski/Pahrump Valley Times Pahrump Valley senior Tristan Maughan, right, battles Benjamin Rowley on Saturday during the 160-pound final at the Chaparral Invitational in Las Vegas. Tom Rysinski/Pahrump Valley Times Senior Isaak Cruz controls Steven Anzalone of Enterprise, Utah, during their third-place bout at 145 pounds Saturday at the Chaparral Invitational in Las Vegas. On the up side, Tristan Maughan, Isaak Cruz and Coby Tillery combined to score 63 team points for the Trojans, who accumulated 106 to finish ninth in the 37-team tournament. On the down side, Donnie Miller and Dylan Grossell, who each had wrestled for the first time this year a week earlier after coming back from a hernia and a shoulder injury, respectively, were back on the sidelines, and Dylan Wright suffered a dislocated shoulder in his opening bout while absorbing his first defeat after 26 victories. Maughan finished second at 160 pounds, Cruz finished third at 145 and Tillery took fourth at 126, combining to go 13-4 over the weekend. But Maughan (26-4) was almost as impressive in his one loss, when he lost 7-6 to Benjamin Rowley of Enterprise, Utah, in the finals, as he was in his four victories. The two took totally different paths to the final. Perhaps nobody in the field worked as hard as Maughan, who went the distance in three of his first four bouts, winning by four points each time: a 7-3 win over Coronado junior David Darlington, a 6-2 decision over senior Joshua Gurbutt of Cheyenne and a 4-0 triumph over Lincoln County junior Trevin Perkins. Mixed in was a pin in 3:16 over David Moore of Arbor View. Meanwhile, Rowley (32-10) was crushing his competition. After a first-round bye, the senior won by fall three consecutive times, finishing off foes in 1:40, 1:08 and 1:26. But the final was another story. Early on, Rowley took control with a takedown and near-fall points, giving him a 5-0 lead after the first period. But, starting on top in the second, Maughan recorded 2 near-fall points and then, after a Rowley escape, scored a takedown with 15 seconds left to go into the third trailing 6-4. Another takedown 30 seconds in tied the bout, and with 55 seconds left Maughan allowed Rowley to escape. But he could not get that final takedown and settled for second place. Meanwhile, the only Pahrump Valley wrestler to end the event with a win was Cruz. After two second-period falls and a seven-point decision, Cruz’s run in the main draw was ended by Coronado’a Andrew Olson in a 6-5 decision. 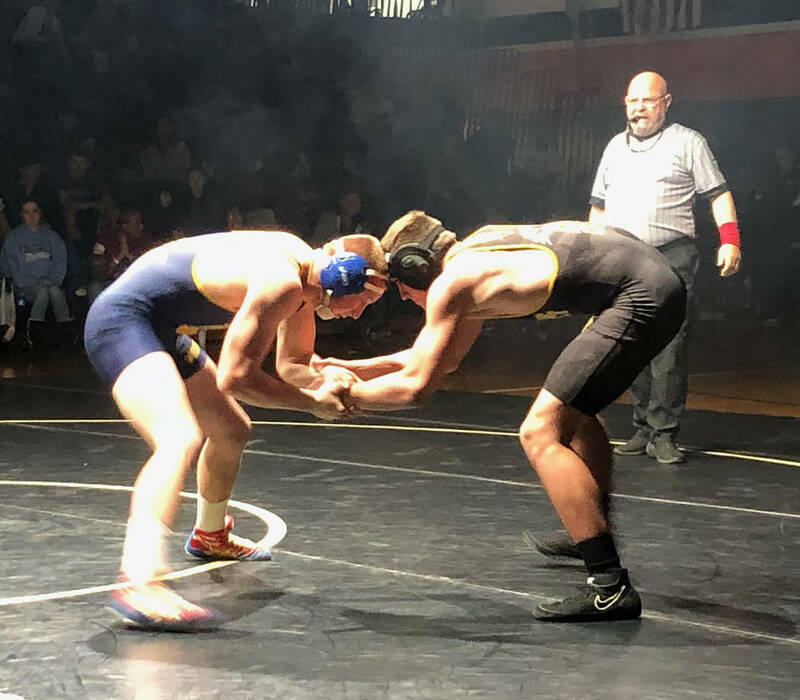 He then rebounded to beat Enterprise’s Bryant Jimenez for the second time in the consolation semifinals to set up a third-place bout against Jimenez’s teammate, Steven Anzalone. It was no contest. Cruz led 5-1 after one and 9-1 after two and coasted to a 12-2 victory. Despite a 26-5 record, Cruz feels much the same way about his season as a whole. Cruz did have another regret: He wanted a shot at Palo Verde senior Grey Garcia, who pinned Olson in the last second of the first period to win the title and improve to 36-6. And he’ll see the ones from Class 3A schools again in the Southern Region Championships on Feb. 1-2 at Moapa Valley High School. Tillery put on a solid performance in getting to the third-place bout at 126. He recorded four pins during the tournament, including in 2:45 against Tatum Pine of Palo Verde in the quarterfinals and in 2:26 over Wyatt Larsen of Enterprise in the consolation semifinals. Tillery led Virgin Valley junior Austin Workman 7-2 after one period in the third-place bout, but Workman turned the tables in the second and came away with the fall in 2:49. Meanwhile, Wright was watching all of that action from the sidelines after his Friday night injury. It came during the second period against Jeremiah Harrison of Cheyenne. Now technically 26-2 after having to forfeit his first consolation bout, Wright is optimistic he won’t be sidelined for long, aiming to be back tonight for the Senior Night match against Western. Otherwise, it was a mixed bag for the Trojans. Garrett Cosper recorded three consecutive pins in the consolation bracket and wound up in sixth place at 113, while Henry Amaya won by fall twice and was eliminated 16-14 in sudden-victory overtime by Alex Sullivan of Western. Both split their bouts at Chaparral, as did Spencer Lane, who recorded two pins at 138, and Armani McGhee, who went 2-2 at 285. The Trojans wrap up the regular season at 6 p.m. tonight against Sunset League rival Western at home.